This depicts the scene at a recent art event called Canvas For A Cause, benefitting the Children’s Medical Center of Dallas. 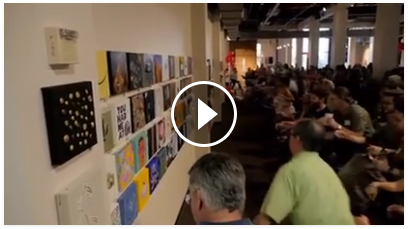 The annual art auction was held at ReelFX Creative Studios in Dallas, Texas, and it raised more than $22,000 for the little tykes over at the hospital, which receives over 360,000 patients each year. The Medical Center treats all kinds of pediatric conditions ranging from simple eye exams to specialized treatment in areas such as heart disease, hematology-oncology, organ transplantation and cystic fibrosis. So, you may ask, why the wild stampede of people toward the canvases hanging on the wall? I personally witnessed the event and had a great time. As I stood back and watched the rush for art, I couldn’t help but reflect on the emotional impact of what art has on each of us… and how, when done right, charity events like this can benefit everyone involved. As mentioned above, the Children’s Medical Center recieved $22,000, and had to expend very little (if any) of their own energy. They also got a positive vote from a local organization who cares about their mission to help children. Need I say more? ReelFX Creative Studios planned, advertised, and hosted the event. The majority of the art came from both current and ex-ReelFX employees (in addition to a few other invitees.) They got some exposure from the event itself, and benefited from the positive public relations boost. It also solidified the view of ReelFX as a top studio that values art and artists. The small size of the canvas didn’t allow for much, and that was a good thing… It implied that the spirit of the event didn’t demand an overly large amount of the artist’s time and resources. Each canvas was a snippet of creativity, a snapshot of each artist’s style. The uniform size also implied a harmony of purpose… and it was a great example of a necessary restraint that made all the divergent styles mesh together as a whole. As a contributing artist, I enjoyed every moment that I participated in the event. I signed my name on each canvas and wrote a title, my name, and my website on the back of the canvases that I contributed. This way, an interested party could have all the necessary contact information they needed to get in touch with me. So, in addition to a potential contact, I was able to network with other artists at the event and just generally had a good time. What’s to lose? This is a good example of a charity art event done right. There are other events that ask a bit too much of the artist (in my opinion) for very little in return. Don’t get me wrong… I’m all for benefiting people who need it. All I am saying is this: do your homework, and weigh the benefits of your efforts versus the outcome. There are charity events that promise large amounts of recognition and exposure in exchange for a lot of your personal time and commitment. I don’t generally recommend the artist do these without careful examination of the return on their time and efforts… not just their own return in publicity, but the beneficiaries’ monetary return as well. For example, some charities hold expensive events that eat up a great deal of the profits from an artist’s contributions… and the main winners in these cases may be the ones being hired to host and organize the event. Like snowflakes, each charity and event is vastly different, and there are effective ones as well as not-so-effective ones. 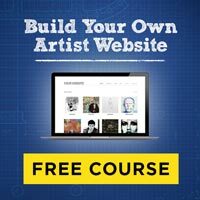 That’s where the homework part comes in… you may need to speak with people close to the organization, including other contributors, to get the information you need to make an informed decision. So what’s an alternative to these types of events? What if you have trouble finding a charity that you want to contribute to? It may be that you sell a canvas at full price totally on your own and split the proceeds with a charity of your choice… and in doing this, the charity may actually get more from it your individual contribution that if you joined with a third party to raise money, which carries the requisite expenses. Furthermore, you would get to choose exactly which charity you want the benefits to go to. Interested in a tax write-off? Read this. If you plan on spending a large amount of time on a piece for a charity event, just remember this: the IRS has rules on the amount that’s deducted for a painting donated to a charity. Many of these rules probably don’t apply to you, because they’re an attempt to crack down on frivolous valuations of art that wealthy collectors have in the past donated to charities as tax shelters. Since I’m not a tax expert by any stretch, I point you to Tax Publication 561, which describes this in more detail. If the value of your art is less than $5000.00 U.S., then you probably don’t have anything to worry about. At the very least, it’s perfectly valid to deduct the time and materials that you used do create the art that you contribute. I encourage you to consult your tax professional for more details. Get Creative… and Get Involved. 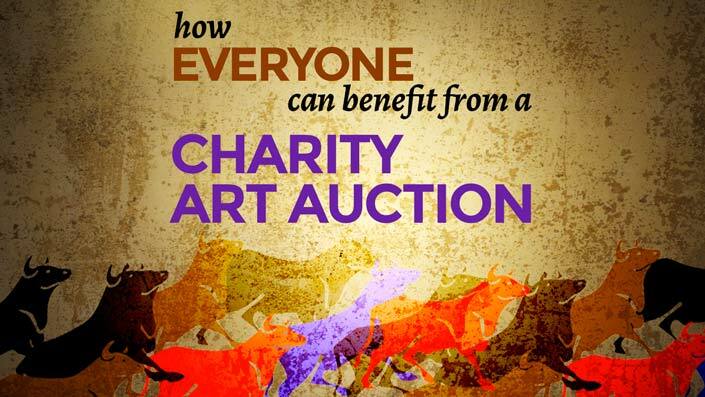 Charity events and auctions are a great way to meet other artists and collectors, participate in a greater good, and do something outside of the norm that benefits others. In addition, they can be a nice little deduction for your taxes under the right conditions. As stated earlier, be aware of the efforts versus the benefits of the art you’re contributing. You can do this by asking how much of the event will be relayed to the recipient versus paying for the event’s expenses, and knowing your personal hourly rate so that you can make an informed decision. What’s YOUR Experience with Charity Art Events? I’d love to hear (as well as the other Artist Myth readers) what your personal experiences are with charity events. Please feel free to share in the comments below.